We recently made some updates to Picasa Web Albums to address some of your top feature requests. In addition to sorting your displayed albums on Picasa Web by upload and album date, you can also now sort by album title. 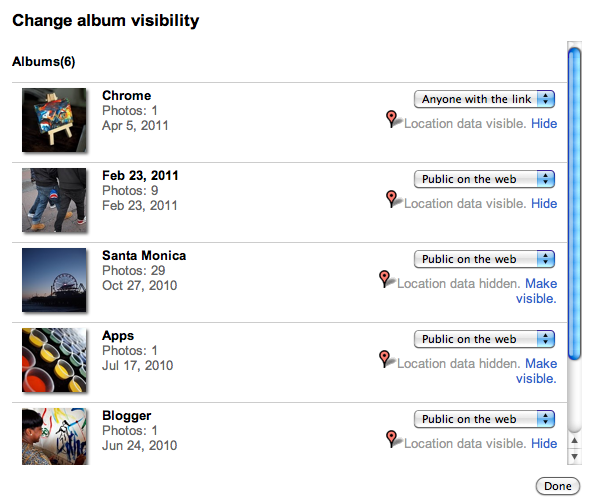 Visit your My Photos tab, then select “Album title” from the drop-down menu. Changed your name, or changed your email address? We added an option to transfer your photos, videos, comments, and people you follow to a new or existing Google account. Learn all about the account migration tool in our help center, or check it out from your Settings page. As always, you can share your feedback about our updates, ask a question, or suggest a new feature in our forum.